I spent a couple of days last week meeting with managers in western North Carolina. I started off on Wednesday morning with Carl Classen, the Rutherford County Manager, and then continued down the road for an afternoon meeting with Bo Ferguson, the Hendersonville City Manager. On Thursday morning I headed far west into Graham County for a meeting with Greg Cable in Robbinsville. I crossed up and over to Boone for an afternoon meeting with Deron Geouque, the Watauga County Manager, and I finished by having dinner in West Jefferson with the Ashe County Manager, Dr. Pat Mitchell. These managers without exception had great things to say about their experience with the School. All four already had paid their local government membership dues for this fiscal year. Each said that it was an easy decision, even though in recent years they had scrutinized and decided against paying some other dues. Before becoming county manager, Pat Mitchell had worked with us for many years as Ashe County’s Economic Development Director. She told me that she went to her finance officer recently and asked about the amount of the School’s dues. When she was told the amount, she couldn’t believe that it was so little and asked if that was a monthly total. I heard much less about budget issues related to the recession, but a couple of counties continue to face longstanding economic development challenges. Rutherford County has a 13% unemployment rate, for example, and 74% of Graham County’s land is owned by the federal or state government―meaning that it generates no tax revenue. There was more discussion about the increasingly ideological nature of local governing boards, and the difficulty of managing in this more contentious environment. It raises interesting questions about whether we can do anything to help them work more effectively in this uncharted territory. The county managers also talked about the difficulty of navigating the host of complex issues around mental health reform. Another consistent theme was a desire for the School to offer more programs in western North Carolina. These managers are incredibly grateful for the increased availability of webinars and for our blogs. At the same time, however, they also recognize that some programs are most effective when offered face-to-face. We agree. There always has been a desire for us to offer more programs regionally, but my sense is that interest is growing. It is worth exploring how we might increase our impact by responding to this interest. The bottom line is that your good work continues to be appreciated by local officials across North Carolina. They see our work with them as a partnership, and I love the opportunity to reinforce it through these meetings with managers. Thanks for all of your hard work–it is making a difference and it is valued. A word about the pictures. 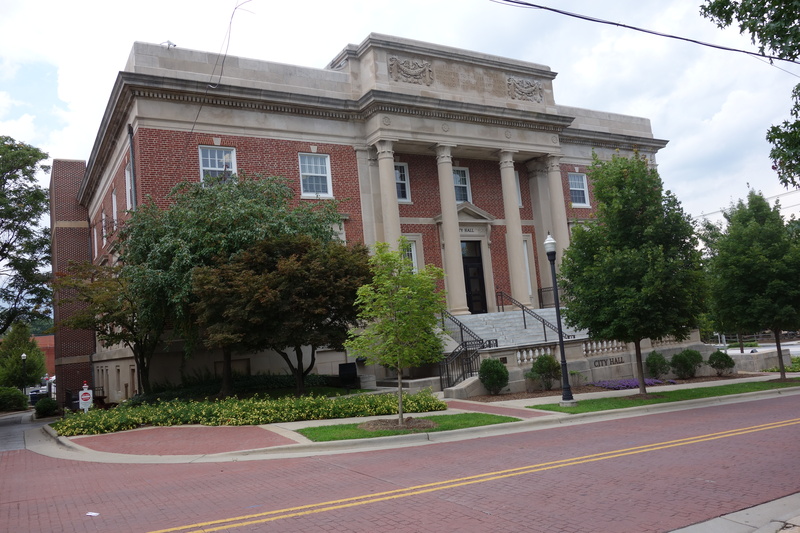 Hendersonville’s Town Hall is a lovely building, even if it is not a courthouse. You can’t see the words carved along the top of the building: “Erected by the People. Dedicated to the Perpetuation of Civic Progress, Liberty, and the Security of Public Honor.” Not exactly the sentiments that you hear these days. 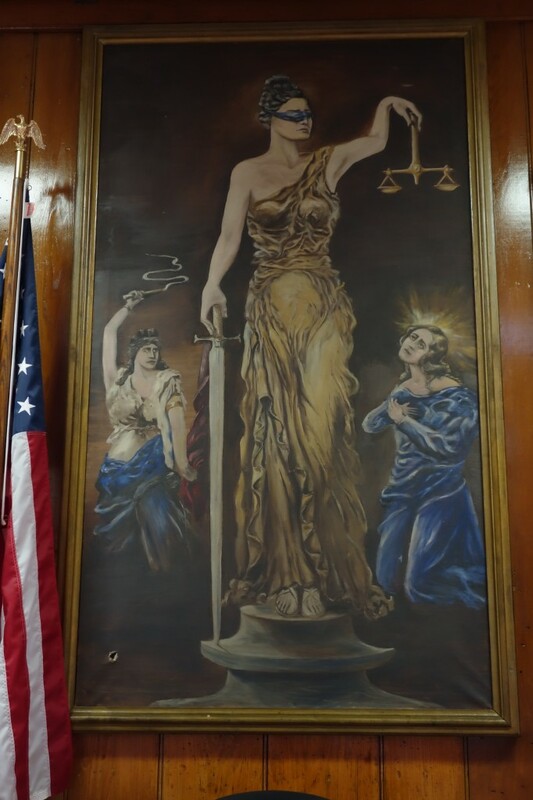 The bottom painting is behind the judge’s bench in the Graham County Courthouse. I’ve seen images of Lady Justice, but never with these accompanying figures. I love it. The bailiff who let me into the courtroom told me to note the bullet hole in the lower left corner. In fact, he says the painting was damaged when it was removed during the filming of the movie Nell, featuring Jodie Foster.